Located 20 minutes away from Mendoza’s city center, the secluded and private Finca Adalgisa is within walking distance of a small but thriving community with shops and restaurants, called Chacras de Coria. Housed in an early 20th century manor house and vineyard estate, each of the eleven guest rooms is unique and comfortable. Each room is well appointed with a private bathroom, air-conditioning, a safe, a mini bar, wireless internet, and a telephone. Other lovely room characteristics include a terrace, a living area, and a fireplace and/or kitchenette. Guests enjoy the breakfast buffet with freshly-baked breads, fruits, fresh juices, marmalades and much more. In the evening you can enjoy a nice glass of wine and tapas in the cozy wine tasting areas inside the small winery located at the finca. Enjoy the boutique hotel’s 5 acres (2 hectares) which include vineyard and fruit trees. Declaring itself "the first luxury lodge at the foothills of the Andes", the Cavas Wine Lodge lives up to this bold statement. 35 acres of a gorgeous Argentina vineyard surround this estate that isn't lodge-like at all in actuality, but architecturally stunning with a welcome area displaying roman-style pillars. Accommodations come in the form of white, individual adobe-style casitas (small houses) that are sure to make your Mendoza vacation experience an unforgettable and luxurious one. Each 970-sq-ft cabana features a spacious living room, large bedroom with its own fireplace, a walk-in closet, and modern cabin-like furnishings that compliment the chic feel each casita bodes. Amenities in each accommodation include internet access, satellite television, cordless phones and stereos that all add that extra bit of contemporary convenience. Guests are invited to enjoy dinner at the on-site restaurant that boasts a menu featuring traditional Argentine meals using organically grown fruits and vegetables. 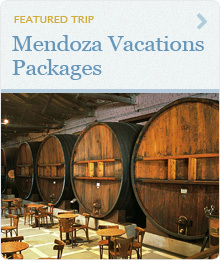 The lodge also has an underground cellar where travelers can sample wines from the Mendoza area. Finally, guests at this Argentina luxury hotel can make use of the relaxing spa where they can enjoy a wine therapy treatment or go for a soothing dip in the estate’s Jacuzzis. This charming country style house combines Andean stone with typical desert wood, allowing for natural, simple, and modern décor. Look out from the hotel windows and you will see the beautiful landscape, swimming pool, hot tub, solarium, and a quincho where guests can enjoy the outdoors. The house only holds 25 guests, which allows for personal and attentive service from the hotels friendly staff. All rooms are tastefully decorated and include wireless internet, air conditioning, central heating, safety deposit boxes, cable TV, and telephones. All rooms on the ground floor have a sliding glass door that faces the garden, and all the rooms on the top floors include balconies. Enjoy the restaurant, wine cellar, massage room, living room with fireplace, swimming pool and Jacuzzi, and free bicycles. Situated in the beautiful Alto Valle de Uco, this stylish estancia offers an intimate experience for guests stay in one of its 8 beautifully decorated rooms. In addition to the friendly service, the hotel offers a living room with fireplace and an adjoining dining room where excellent homemade meals are served. During your stay at Posada Salentein you can explore the winery and enjoy wining tastings at the bodega. This charming hotel also offers central heating, air-conditioning, and a swimming pool.